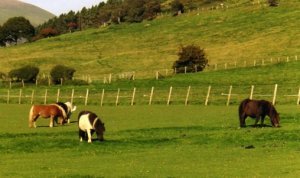 Gwyddelfynydd Shetland Pony Stud is a small stud of 15-20 ponies. Set in the beautiful Dysynni Valley running up to Cader Idris in the Snowdonia National Park, most of the ponies are based on Knock and Marshwood bloodlines with a few others of different breeding but of a similar type. My aim is to breed standard ponies that have good conformation, movement and temperament and also win in the show ring. I hope you enjoy looking round my website - keep an eye on the For Sale page as some ponies may well be for sale later in the year. The website will be updated from as shown below.